You know what? It's me. I'm way too proud of the Super99 avatar I made. the best comment of the day? I'm so, so sorry. 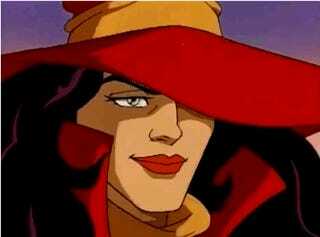 I've been thinking about Carmen Sandiego all day and how I really want to find a copy of that one good game, where you had 360 view of a place, lots of people to talk to, and if you wanted you could just fly around the world getting tours? And there were tons of mysteries to solve before you got to Carmen herself? And the Chief gave you the mystery via video? I WANT TO PLAY, INTERNET. MAKE IT HAPPEN. Anyhoodle poodle, let's get to the comments! Wait, why do helium balloons act so strangely? And I (humbly) submit the thread 99TelepodProblems, xeos_ and I had last night. I don't want to spoil it, but corgis and poorly MS Paint-ed avatars are involved. WHO'S IT GONNA BE? Patty Larceny? Sarah Nade? Or Stu L. Pidgin? Perhaps I'll just spend all day naming V.I.L.E. villains?